Al comprar este producto acumulará 250 euros de saldo para compras futuras. Instalado en su sistema, el PC-2 Evo+ transforma la escucha y mejora todos los criterios habituales : la dinámica , la escena , la definición, el respeto por el silencio y la precisión de los timbres. PC-2 EVO+ is the first one in a new class of conditioners, which differ significantly from previous GigaWatt products in terms of concept. The PC-2 EVO+ is the result of an evolution of conditioner constructions. Now GigaWatt, renowned for the traditionally high manufacturing quality and unrivalled performance, assures that the new series of conditioners will offer even better improvement of resolution and dynamics of the sound. This new design also attributed to the reduction of weight of the conditioner, as well as to the increase in acceptable load of the output filters, and absolute operational silence of the unit. The modular design of the PC-2 EVO+ has no separation transformers, which had the function of additional filtering in the output stages, which were dropped in favor of worked out, multistage parallel filtration circuitry. The construction of the conditioner is based on a number of separate modules, which include: an overvoltage protection circuit and initial filtration, a system of lossless power distribution, a double compensation circuit and three autonomous filtering blocks. Each of the conditioner’s filtering branches – dedicated to digital, analog and high current devices – includes independent passive filters, separate for each pair of sockets. In this concept, it is possible to fine tune each of the filtration branches to the character of the load it will work with, different for each kind of receivers. It also allows for isolation and elimination of interference generated by the interconnected devices, which share a common power line. Each of the filters inside the conditioner is made from high quality elements. Interference is damped by, among others, metalized polyester capacitors with low inductance. They are made from a foil, which is supplied by the German company BASF, and the capacitors are manufactured in Philips factories. All elements of each filter are mounted on a massive PCB, with high cross-section of the traces, using silver solder. In the PC-2 EVO we resigned from using any thermal or over-current fuses, which throttle the current flowing to the protected circuit and have a negative impact on the sound. Protection against over-current and surges is provided by modern, multistage protection circuits, made from plasma spark-gaps and new generation varistors. The protection built into the conditioner cooperates with a modern electric network, guaranteeing complex protection. Each of the filters is powered from three massive distribution bars, made from thick slabs of solid copper, with a cross-section of 30mm2 per bar. Those bars allow for an even and stable power distribution, regardless of the load on any of the filtering branches. The production of such bars is quite expensive, due to the required copper quality and the technology needed for their manufacture. The distribution bars are made from cathode copper with a purity of minimum 99.99%. This copper from the type Cu-ETP, refined in a metallurgical process. It is characterized with high conductance, low contamination and low residual oxygen content. The copper for the bars is being enameled and annealed, which makes the metal more dense – improving conductance, plasticity and resistance to corrosion in most environments. Mechanical processing of the bars is done in a technology with no heat emission, as it could oxidize the copper and negatively influence its conductance. To allow for the highest possible impulse response, the PC-2 EVO conditioner is equipped with a proven, double buffering circuit with new generation compensation cells. This circuit also increases the current efficiency of the conditioner with non-linear loads, like power amplifiers, allowing for an almost unlimited impulse capability. On the back plate of the conditioner there are six, high quality power sockets, with silver plated connectors, and each pair of the sockets is individually filtered. Similar to the top conditioner PC-4, the outputs were divided in three separate sections: digital, analog and high current. 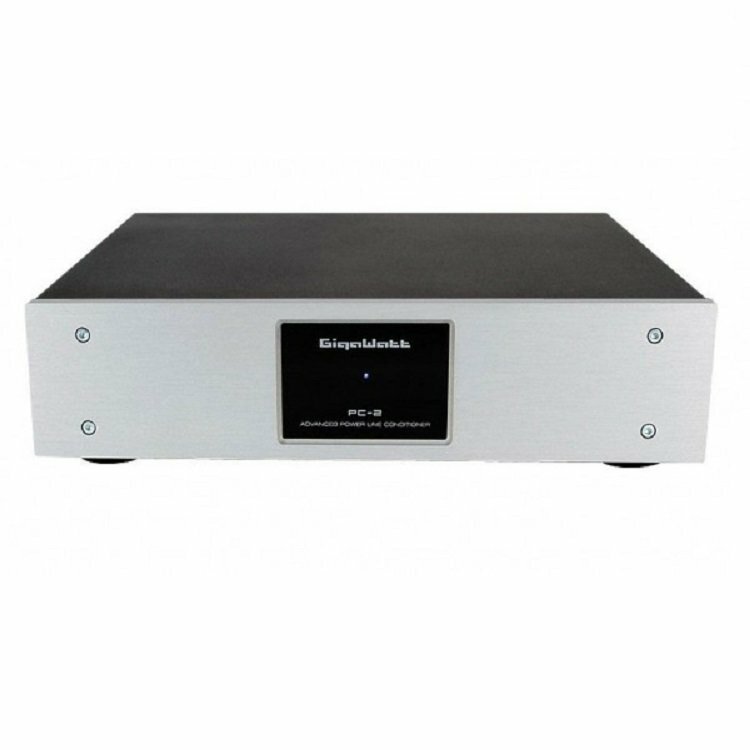 The digital output is dedicated to CD players and transports, DVD players, DACs and TVs. 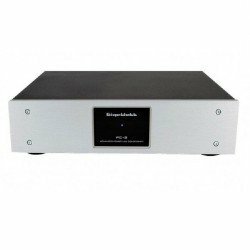 Analog outputs are to be used for tube amplifiers, turntables, preamplifiers and smaller integrated amplifiers. High current output is designed for all high current drawing devices like power amplifiers, high power integrated amplifiers, some tube preamplifiers and video projectors. The mechanical construction of the conditioner is based on a very rigid metal chassis, which, in combination with vibration damping feet, reduces all possible vibrations and resonances. 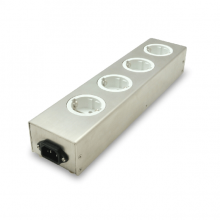 All components of the enclosure are made from steel-aluminum elements. Proper combination of those materials results in a perfectly sealed shield against RFI and EMI interference. The conditioner PC-2 EVO is already available for sale. 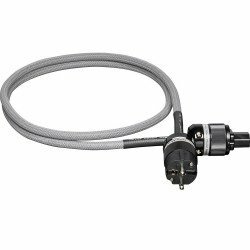 It is equipped with the LC-1 (MK2) cable as standard; at extra charge it can however be equipped with the splendid cable LC-2 (MK2). La regleta- filtro PF- 1e puede alimentar hasta seis dispositivos de 16Acon un máximo de potencia total de 3500 watts. El pico de carga máxima admitida es impresionante ( 13000 A! ) y permite considerar su conexión con amplificadores de potencia de tamaño considerable. 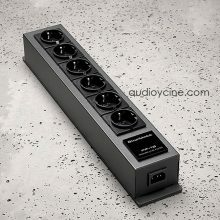 La contribución del cable LC- 1 MK3 en la calidad de sonido de un sistema es sorprendente a la luz del precio de venta .